Architectural Engineering is a relatively specialized field of study; UW is one of only 18 institutions nationwide to offer an accredited degree in this discipline. Architectural Engineers are trained with a rigorous technical knowledge about building systems, but also with a holistic view of how those building systems are integrated within the overall building design. 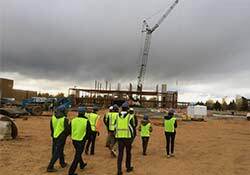 They are trained to collaborate with architects and others in the building industry. Structural Systems: A Structural engineer is responsible for the strength and stability of the building. Structural engineers are charged with understanding how much weight a building must support and what other forces it must resist. They design foundations, beams, girders, trusses, columns, floors, walls, and roofs, and they work with architects to make sure those elements are coordinated with the building plan. MEP (Mechanical, Electrical and Plumbing) Systems: An MEP engineer is responsible for the Heating, Ventilation and Air Conditioning (HVAC) systems, as well as Plumbing, Fire Protection, Electrical and Lighting systems. MEP engineers work with architects to make sure the building is comfortable and that it is using energy efficiently. Construction: A construction engineer is responsible for the building being built properly and safely. Construction engineers may schedule and manage excavations, heavy equipment, deliveries of materials and workers. Is it the same as Architecture? No. In terms of education, they are different degrees. A B.S. degree in Architectural Engineering (which UW offers) will prepare you to become a professional engineer. A B.Arch. or M.Arch. degree (which UW does not offer) will prepare you to become a professional architect. In the professions, architects are responsible for the overall design of a building and design to meet the needs of a client. 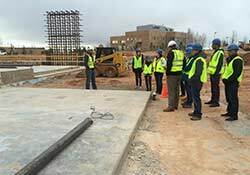 They hire engineers to help them design and developing the details of the building systems, including: structural, heating/air conditioning, plumbing, fire protection and electrical. Engineers have technical expertise which architects do not. Can I get B.S. degree in Architectural Engineering at UW and then an M.Arch. degree elsewhere? Absolutely! This is an excellent strategy because you will develop a multitude of interrelated skills and have many possible career paths. UW has relationships with a number of regional architecture programs to make the transition as seamless as possible. Why should I come to UW and major in Architectural Engineering? There are many excellent reasons. UW’s Architectural Engineering program has strong relationships with major employers, and we have a great track record in internship and job placement. Our faculty is dedicated to excellent teaching and research in leading-edge topics within the discipline. The building industry has changed dramatically in the past decade, and we are proud of our dedication to staying current. If you prefer a hands-on education, Architectural Engineering is for you. You’ll find yourself building a brick wall in class, or going to visit a construction site. Bring your gloves and work boots! If you enjoy computer models and simulations, Architectural Engineering is for you. In fact, UW is known for being at the forefront of computing. We have received national recognition three times for leadership in Building Information Modeling (BIM). We’ve found that UW graduates get more job offers and higher salaries because they can use the latest computing tools. Finally, as an architectural engineer, you can make a difference in helping to solve the world’s social problems. For example, buildings generally use too much energy. This is a waste of capital and a problem for the climate and environment. We train students to understand how buildings can be designed to use less energy, and to keep the occupants healthy and happy. Where can I learn more about the profession of Architectural Engineering? The Architectural Engineering Institute (AEI) is the professional society for Architectural Engineers. Click here to visit. A Structural engineer is responsible for the strength and stability of the building. Structural engineers are charged with understanding how much weight a building must support and what other forces it must resist. They design foundations, beams, girders, trusses, columns, floors, walls, and roofs, and they work with architects to make sure those elements are coordinated with the building plan. An MEP engineer is responsible for the Heating, Ventilation and Air Conditioning (HVAC) systems, as well as Plumbing, Fire Protection, Electrical and Lighting systems. MEP engineers work with architects to make sure the building is comfortable and that it is using energy efficiently. A construction engineer is responsible for the building being built properly and safely. Construction engineers may schedule and manage excavations, heavy equipment, deliveries of materials, and workers. In terms of education, they are different degrees. A B.S. degree in Architectural Engineering (which UW offers) will prepare you to become a professional engineer. A B.Arch. or M.Arch. degree (which UW does not offer) will prepare you to become a professional architect. In the professions, architects are responsible for the overall design of a building and design to meet the needs of a client. 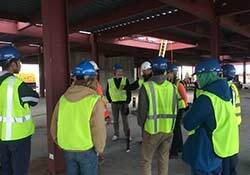 They hire engineers to help them design and developing the details of the building systems, including: structural, heating/air conditioning, plumbing, fire protection, and electrical. Engineers have technical expertise which architects do not. Could I get B.S. degree in Architectural Engineering at UW and then an M.Arch. degree elsewhere?